There might eventually be a Prime Minister of Great Britain. There might already be one by the time you are reading this. For now the question is still somewhat open, as Cameron the Tories failed to position themselves as the alternative, allowing Clegg with some handy middle eastern backing to be position by the media as the left wing alternative to the "establishment". The UK election was such a hard one to care about, because it was a case of three men battling each other over their mutual lack of ideas and the only real debate was over which of them was hard left and which of them was soft left. All three candidates shamelessly pandered to Muslims. One had freed the Lockerbie bomber in exchange for an oil deal. One yearned to really crack down on Israel for standing up to terrorists. And one stayed for a week with a Muslim family and declared that the English had a lot to learn from Muslims. And he was the "conservative" candidate. The election was an all around disaster where as elsewhere an angry public wanted change, and only had the usual suspects to choose from. That aside from some funny business at the polls as well. Either way the ascendancy of the Liberal Democrats is likely to push Labor even further left to compete, which is likely to push the Tories further left too, as Cameron has already shown. So whoever forms a government and becomes the next PM, the UK will lean even further left. And as a testament to that, not only did the Liberal Democratic Dog have its day, but so did the Green Party dog, with the first Green MP being elected. For the people who thought the Liberal Dems just weren't crazy enough. Good news for Jews in the UK, Caroline Lucas also rabidly hates Israel. How sick and evil is Caroline Lucas, aside from just calling for a boycott of Israel, she disgustingly blamed the terrorist attacks in Mumbai on Israel. And yes she has ties to Hamas as well. Change. Can you smell it? Over in Americaland, a lot of conservatives are outraged over Palin's endorsement of Carly Fiorina, though by now it should have surprised no one. Palin's endorsements have not been based on principle, but on practical politics, as I've been saying all along. There is no political consistency between McCain, Rand Paul, Carly Fiorina, Lindsay Graham... the only consistent element is that she's building a base of support. Now whether this is a bad thing or not is open to debate. Beyond all the media buzz and the image we have of her, Palin was a successful politician who made it to Governor of Alaska. That means she understands politics better than some people might think. It means more to the point, that she is a politician. And she's doing what it takes to win. The question as always is how far do you go to win before you lose the principles that make winning worthwhile. Different people will draw that red line in different places. Palin's endorsements give us some idea of where she draws her red lines. Anyone expecting absolutely uncompromising stands should be aware of that. On the other hand politics is practiced as a duet of lesser evils and compromises. It may not be possible for any national leader to avoid that. And it may not be realistic to expect it. I can't entirely disagree with her endorsement of Fiorina, not because I like her, but because the Tom Campbell factor means that taking a risk on DeVore could mean something worse than even a Boxer victory, but the victory of a man with ties to terrorists running on the Republican line. But I don't think that was Palin's primary calculation, because of her enthusiastic backing of Rand Paul, who is nearly as bad as Campbell. And so we're left with the sinking feeling that we're back to politics as usual, and the even more sinking feeling that politics is as usual is at least part of what it will take to win. At the end, like most Republicans, Palin has tried to balance her embrace of the Tea Party movement with pragmatic politics in a system in which the support of insiders seems to matter more than the support of outsiders. I won't condemn her for it, but neither can I really praise her for it. I would like to believe there's a better way. And the Tea Party movement that she embraced is fighting for a better way. Over in D.C., though the "insults" keep on coming. Just in case Obama missed the point of Russia orchestrating a coup in Kyrgyzstan in order a US base that serves as a lifeline to US forces in Afghanistan... while Obama was hugging it out with Medvedev, this time it was Biden's turn to get an "insult"
Vladimir Putin has snubbed both the Prince of Wales and the US vice-president, Joe Biden, by refusing to allow them to attend a parade in Red Square marking the 65th anniversary of the end of the second world war, the Guardian has learned. Russia invited Gordon Brown and other heads of state to attend the Kremlin's celebrations on Sunday – the biggest ever. But with the prime minister unable to attend because of the general election, the Foreign Office suggested Prince Charles instead. Last week, however, the prince was quietly stood down after Putin made it clear that he did not want him there – apparently in a sign of his continuing annoyance with the UK over its failure to extradite Boris Berezovsky, the Kremlin critic and former oligarch, to Russia. Putin, Russia's prime minister, also snubbed Biden, who had planned to go to Moscow and has been left kicking his heels in Brussels. The White House is privately furious at the snub. Barack Obama told Russia's president, Dmitry Medvedev, he was unable to attend but had confidently offered Biden as his replacement. Moscow's diplomatic corps has been abuzz all week with news of Putin's unexpected veto. Felgenhaur said the Kremlin was in an uncompromising mood following a string of recent foreign policy successes. These include the overthrow of Ukraine's pro-western government and its replacement by a pro-Russian one, and last month's revolution in Kyrgyzstan, now run by a more Kremlin-friendly administration. For the first time, troops from Britain, France and the US – the Soviet Union's wartime allies – are taking part in the victory parade, marching alongside 10,500 Russian soldiers. More than 25 foreign leaders will attend, including France's president, Nicolas Sarkozy, and Germany's chancellor, Angela Merkel. Now unlike Israel passing a potential building through one stage of a multi-stage approvals process while Biden happened to be in the country-- this is an authentic insult. And the only coverage of it comes from a British paper. Nope, no media bias there. And Obama may be furious, but when it comes to Russia, he's also impotent. He pandered to Putin and all he got for it was a slap in the face. Now the US and the UK have sent troops to celebrate Stalin's own "Victory Day" when Germany surrendered to Russia, after it had already surrendered to the Allies. The point of this, as with much of Soviet revisionist history of WW2, was to sideline the Allies and turn Stalin and the USSR into the key figures in a war which started when they decided to collaborate with Hitler. Many former Warsaw Pact countries have since switched to the normal V-Day date. But the US and the UK chose to recognize Russia's Stalin era Victory Day instead, itself a bad concession, and one that undermines the decision of former Warsaw Pact countries that had the courage to break with the Soviet version of history. But they got slapped in the face for it again, because US and UK troops will march without US and UK leaders permitted to be in attendance. Part of this is Putin slapping Obama and Brown around, because he knows he can. Part of it is anger. Medvedev showed up to Obama's farce of a nuclear summit. Putin expected Obama to make an appearance at his little parade. That was Putin's mistake, because Michelle doesn't like to go to the same place twice and Obama likes Hawaii style temperatures. On top of that even he can't fail to remember that when he and Hillary Clinton have dealt with the Russians, they were repeatedly insulted. So Obama may have simply chosen discretion as the better part of cowardice, by avoiding a situation where his Russian hosts would have predictably tried to humiliate him. 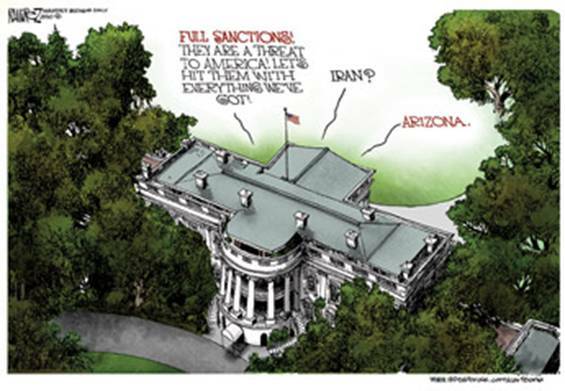 The entire mess only highlights how weak Obama is against enemies and competitors. And how the United States is weakened by his presence in the White House. And just if abusing and turning on traditional allies such as Britain and Israel wasn't enough, now Japan joins Obama's Enemies List. One of them is Kuniko Tanioka, a member of Japan's upper house of parliament and the ruling Democratic Party of Japan, and a close advisor to Hatoyama. During a visit to Washington Tuesday, Tanioka leveled some of the harshest criticism from a Japanese official to date of the Obama team's handling of the Futenma issue, which is still unresolved despite months of discussions. "We are worried because the government of the United States doesn't seem to be treating Prime Minister Hatoyama as an ally," she told an audience at the East-West Center. "The very stubborn attitude of no compromise of the U.S. government on Futenma is clearly pushing Japan away toward China and that is something I'm very worried about." At this rate Obama is quickly running out of traditional allies to alienate and he sure as hell isn't making any new ones. Now in 2004 and 2008, Democrats claimed that American alliances were in terrible shape and that we had alienated the world. But Obama has managed to destroy America's closest alliances in a year. And unlike Bush, he hasn't done it because he went to war or tried to achieve any major new international objective. No, Obama is destroying our alliances because he can. Yes I can. Remember that one. Yes he not only can, but he's doing it. And we can only begin to imagine the work that any legitimate American President will have after him in repairing what he has done. Not just at home, but internationally as well. The proper tribute to Obama may be the one on Zombie's blog, the poem Obamandias. The rest were run out of town on a rail, or fled. The lone and lifeless prairie stretches far away. The MyRightWord blog has an interesting academic study on the costs of harboring terrorists. The economic costs. This study was done in Israel, but Americans are increasingly experiencing the economic consequences of terrorism as well. The media meanwhile is experiencing the economic consequences of being useless dinosaurs. The fall of the TV News Networks is underway. I predicted this before, but it's now accelerating. ABC and CBS are making major staff cuts. CNN is on its last legs. And it must frighten and infuriate liberals, that FOX news not only has the best economic position of the bunch, but is actually bringing in lots of money-- while CBS News and ABC News and CNN are giant holes of red ink. And there are only three viable cable news networks to fill the void. And calling CNN viable these days is a joke. Time to bury those dinosaur bones. Not that the media isn't hard at work promoting a boycott of Arizona. The often violent immigration demonstrations are taking place under the deliberate encouragement of the Democratic party and the media. The same media which smeared the Tea Party protesters as dangerous and violent extremists. And meanwhile the same people who recently began barking that support for Israel is treasonous have nothing to say when Mexican Cinco De Mayo celebrations are done in ways that aggressively exclude American patriotism. Galli says he and his friends were sitting at a table during brunch break when the vice principal asked two of the boys to remove American flag bandannas that they wearing on their heads and for the others to turn their American flag T-shirts inside out. When they refused, the boys were ordered to go to the principal's office. "They said we could wear it on any other day," Daniel Galli said, "but today is sensitive to Mexican-Americans because it's supposed to be their holiday so we were not allowed to wear it today." And there in a paragraph is the problem. Irish-Americans don't get offended by US flags on St Paddy's day. Jews don't get offended by US flags on Israel's Independence Day. You can wave the flag on Martin Luther King day. But apparently Cinco De Mayo is a national celebration that excludes and is hostile to America. And that is a major problem. The biggest. Some of this is the work of radicals, but the fact that it's so widespread is ominous. This is not about WASPS vs Latinos as the liberal activists would like to paint it. One of the boys was Hispanic. Some of the patriotic protests have come from American Hispanics. The problem is the growing radicalization of some Latinos by racist groups such as La Raza, which now has a seat on the Supreme Court, and left wing groups. As some readers already know, I will be attending a panel on the new media confronting old media in Los Angeles. You'll find the full details below. Articles will continue to appear on the blog however, but I may not be personally available. Lemon of Lemon Lime Moon will be moderating comments and running the blog, which stands to reason as she designed much of it. Please give her your full cooperation. One final note, I have received a number of emails from people with AOL addresses, but every time I respond, the email bounces back. I don't know whether this is a quirk involving AOL or Yahoo, but either way I can see your emails, but I'm not able to reply to you. If you sent me an email from an AOL account, either try to resend it from another account, or wait till the problem clears up. Because I've seen your emails, but I simply can't reach you with a response. And now on to the panel news. What motivated these skilled individuals to expose and present news information and why should we trust them over the New York Times? One time opportunity to hear and meet these respected “new news media” journalists. They will discuss the attempt by the current administration and other political forces to delegitimize bloggers’ contribution to honest and legitimate news investigation. Can that happen? Is free press in perilous status? Jim Hoft is proprietor of the "Gateway Pundit" blog from the Heart of America- St. Louis, Missouri. 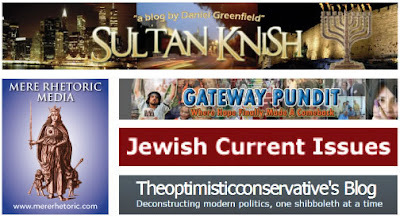 GatewayPundit is a major resource for right-of-center news. The blog is currently listed as the #8 political blog in the United States according to Wikio rankings. The blog is the number two most trafficked news website in St. Louis, Missouri behind the Post-Dispatch with 1.8 million visitors each month. The site is listed as one of the top 100 collective news resources at Memeorandum and was listed as one of the top 100 blogs in a Carnegie Mellon University study. Jim Hoft was credited with forcing Barack Obama’s Green Czar Van Jones into stepping down from his post in the White House. Jim Hoft has a personal devotion to democracy and freedom and follows liberty movements from inside Iran to the streets of Azerbaijan. Daniel Greenfield is an author and activist, born in Israel and currently living in New York. He broke the story of Obama's ties to Father Pfleger in early 2008 and authored investigations of the Islamist ties of Congressman Mark Siljander and the anti-war ties of the Durham Torture Dems. He exposed an International Women of Courage award winner's ties to Hizbullah and Fatah terrorists as well as the Farrakahnite connections of many of Obama's affiliated clergy. He is a contributing editor at Family Security Matters, a regular author at the Canada Free Press and authors his own blog at SultanKnish.blogspot.com. J.E. (Jennifer) Dyer is a retired US Naval intelligence officer who served around the world, afloat and ashore, from 1983 to 2004. Her last operations in the Navy were Iraqi Freedom and Enduring Freedom in 2003. She lives in the “Inland Empire” of southern California now and is working on a book on the Cold War. She has become known for her incisive analysis and down to earth well informed views about America's allies and foes. J.E. Dyer blogs for Commentary, Hot Air, and her own blog, TheOptimisticConservative.wordpress.com where she proves that the internet lives up to its potential. Omri Ceren is the founder and editor at Mere Rhetoric, a political blog dealing with the geopolitical, cultural, and economic dimensions of the global war between the West and political Islam. He also hosts a weekly radio show for One Jerusalem Radio, The Omri Ceren Show, and has published articles in multiple newspapers, including the Jerusalem Post, the LA Jewish Journal, and the Pittsburgh Jewish Journal. His investigative journalism has been cited in the Associated Press, Reuters, CNN, and the BBC, most recently when he uncovered that Human Rights Watch's anti-Israel investigator Marc Garlasco was a Nazi-obsessed collector. Professionally, Omri is currently a PhD candidate studying communication and media at the University of Southern California's Annenberg School for Communication. Rick Richman, the founder and editor of Jewish Current Issues, is an extraordinary blogger and contributor to The Jewish Press, American Thinker, Jewish Journal, The New York Sun, Pajamas Media, the Contentions blog and Commentary Magazine. Rick’s posts and articles are always highly analytical and meticulously discerning, based on original sources and texts. He manages to address current events with clarity as well as heart - and even a wry sense of humor - not found in the mainstream. Enjoy the weekend. And see you there. As usual straight to the point. Russia has never respected weakness and that's all that Obama shows.In even not 2 years he has brought America down to a point that hardly anyone respects it except for a few Muslim countries.Unemployment is at a record high and still climbing ,financially they are quickly catching up with Greece and there will be nobody to bail it out.With leaders like that America doesn't need enemies,it's destroying itself from the inside out.In the end there will be a new North - South conflict those pro Muslim and those opposed to it.Already now you see states voting separate laws contrary to wishes of the government and that's only the beginning.Obama is lethal to America as a nation. Freedom of the press--blogs are the only form of independent press these days. The large daily newspapers are horribly biased and many of the alternative presses are funded by politicians. The weekly newspapers are also subject to political bias. Trust me, I know. I think the problem is definitely AOL. I've had many problems myself, including getting mail dated as being sent in 2058; emails sent out but never received, yet I don't get the mail error return email when it gets bounced. Note, that Shimon Peres was invited, and will be given an honorary doctorate. Putin knows who sympathized with and enabled Hitler, collaborated with the Vatican and saved all the top Nazis after the Nurenburg farce - the US and Great Britain. If Hitler won the war, the US (which opened the long-awaited 2nd front in June of 1944) would have made peace with Germany, and there would be another Holocaust, this time in the US. Instead, the US had to suffice with dominating Western Europe, Africa, and Latin America, until it succeeded in destroying the USSR and setting the Eastern block's economy back a 100 years, and in addition creating several Muslim states on traditionally Eastern Orthodox Christian Hitler-fighting territory. If you were Putin - what would you do?! Yes Putin would know, considering that Russia enabled and allied with Hitler, shipped him materials at a time when their own people were starving.